Padmasana - the Croatian Buddhist Society was founded in 2001, by Mr. Dragutin Šmalcelj after studying over 8 years in India under the guidance of many accomplished Mahayana Buddhist masters. It was under the blessing of H.H the Dalai Lama and other teachers that this Society came into being to spread not only the teachings of the Buddha but to uphold the idea of Rime (Rimed) pronounced as Remay. The Tibetan word Rime means non-sectarian, or an approach which is non-bias to the teachings of the Buddha. The Buddha expounded 84,000 different types of teachings suitable to the different capacities of beings. Within these set of teachings also are included those which are taught and practiced by the different school s in Tibet such as the Nyingmapa, Kagyupa, Gelugpa, Sakyapa and the Jonang. Since all these teachings came from the enlightened mind of the Buddha, it would be absurd to say which one is better, original and complete or to discriminate one from the other. Through understanding differences among individual capacities, Rime approach appreciates the differences between the schools. Furthermore a non-sectarian approach preserves all teachings, as well as prevents them from degenerating. However it is of vital importance to understand that Rime, is not another school or tradition by itself. During an interesting dialogue with Ven. Doboom Tulku Rinpoche, Dragutin and I were advised to preferable use the word non-sectarian rather than Rime, as often the word Rime is misinterpreted to be a kind of a new movement or tradition. Rime is nothing outside of the major schools of Tibetan Buddhism. It is not something in and off itself. 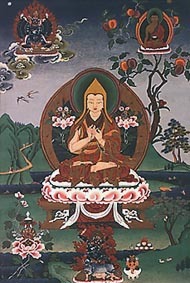 Therefore teachers supporting the Rime approach can be found in all the traditions of Mahayana Buddhism in Tibet such as Lama Je Tsongkhapa in the 15th century from the Gelug school, in the 19th century Jamyang Khyentse Wangpo Rinpoche the Sakya lineage holder, Jamgon Kongtrul Lodro Thaye Rinpoche from the Kagyu and Nyingma tradition, Terchen Chokgur Linpa and Patrul Rinpoche from the Nyingma school, 15th Gyalwa Karmapa-Khakhyab Dorje, late Dilgo Khyentse Rinpoche, Ven. Khunu Lama Tenzin Gyaltsen and many others. In today’s time this approach is very much supported and kept alive by the efforts of eminent teachers like H.H. The 14th Dalai Lama, H.H. 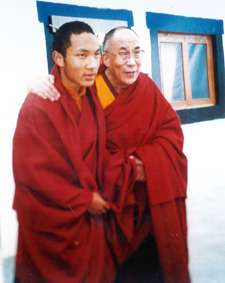 The 17th Gyalwa Karmapa - Ogyen Trinley Dorje, H.H. 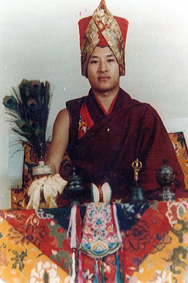 Sakya Trinzin, Arjia Lobsang Thubtan Rinpoche as done on behalf of his master the H.H. 11th Panchen Lama, Ven. 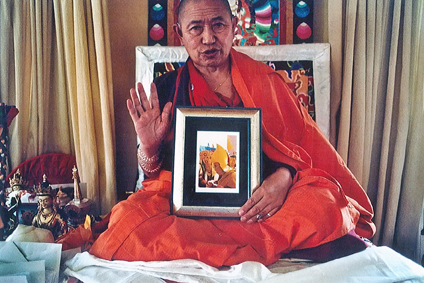 Garchen Rinpoche, Ven. 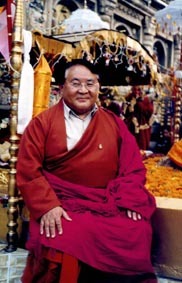 Sogyal Rinpoche, Ven. 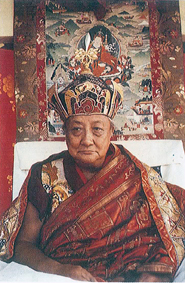 Dzongsar Jamyang Khyentse Rinpoche, Ven. 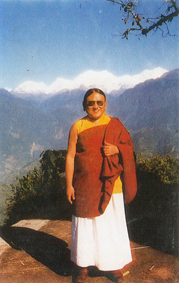 Khamtrul Rinpoche from Dharamsala and many other teachers. Another word of caution is that Rime or non-sectarian does not mean taking practices from different traditions and combining them up in all kinds of ways. That would lead to the degeneration of the Dharma, and pollute the purity of the unbroken transmissions. So even when one individual is practicing teachings or practices from different traditions and lineages, the authenticity, purity and blessing of the lineage must remain as it is within the practice itself. When we talk about a non-sectarian approach, a question that often comes up is how does this function on an individual level and in a Buddhist group? One way of following the Rime, is to study and understand all different traditions. For example there are many teachers who although belonging to one particular school have studied sutra and tantric teachings from different teachers of different lineages, and then teach them impartially. How all the four schools are important having their own specific qualities is expressed by H.H. The Dalai Lama in one teaching where he quoted Lama Jamyang Khyentse Chokyi Lodro saying, “When the great Nyingmapa adept Longchen Rabjam gives a presentation of the ground, path and fruit he does so mainly from the perspective of the enlightened mind of a Buddha, whereas the Sakyapa presentation is mainly from the perspective of the spiritual experience of a yogi on the path ,and the Gelugpa presentation is mainly from the perspective of how phenomena appears to the ordinary sentient beings.” H.H The Dalai Lama has also composed a prayer for the Rime movement including different figures and lineages. During a lecture the 17th Gyalwa Karmapa Ogyen Trinley Dorje likened the teaching of the sutra and mantra traditions to a tree trunk and the varieties of lamas holding lineages with their diverse traditions being like the numerous branches of the tree. Another approach to Rime is where the teachers although study and practice under a certain tradition, later through their realizations are able to perceive all the traditions as important and in essence being the same. One Example is the Kagyu Yogi Ven. Garchen Rinpoche who on visiting our Buddhist Society, delighted to hear of the emphasis on a non-sectarian approach said that once he was asked to make a wishing prayer for the complimentary nature of the four traditions and then this image came to him. He saw the tradition of the Gelugpa like a big trunk of a tree, the Sakya tradition like all the different branches, Nyingmapa tradition like the flower that opens in the end of the branches and the Kagyu tradition like the fruit that comes from within. So each of them is very necessary and flowing through all these various parts of the tree is water which is the love, compassion, Bodhichitta as taught by the Buddha. 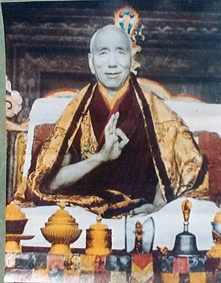 Further Rinpoche added that each of the four schools have work to share where the Gelugpa and the Sakyapa have specialized in particular ways to protect the entire variety of teachings of the Buddha, while the tradition of Kagyu and Nyingma have specialized to keep the flow of realization. If asked on the level of a Buddhist Group or Society how does Rime function? There seems to be different approaches. In our Buddhist Society on the level of Sutra we study the teachings of the gradual path taught in all four traditions. These being Lamrim Teachings of Lama Je Tsongkhapa based on work of Atisha, Lamdre teachings of the Sakya tradition, Ornament of precious liberation by Gampopa being the fundamental Kagyu teaching and in the Nyingmapa tradition Patrul Rinpoches text the words of my precious teacher. Since Mahayana is nothing other than Bodhichitta, we study the works of renowned masters like Shantideva, Atisha, Nagarjuna, Ngulchu Thogme Zangpo so on. On the level of Tantra different teachers are invited from different traditions to teach different practices of their lineage. It is important to understand that among the practices of Tantra, Mahamudra, Dzogchen that although each of them has differences in terms of specific qualities, they are in no means contradictory to one another. For example the word Rigpa or pure awareness in Dzogchen teachings is of the same meaning as the Innate mind of clear light in the highest yoga tantra, yet there are specific differences within the two types of teachings with regard to Rigpa or clearlight. So it is important to expose the students to the different teachings, hence a non-sectarian approach. This kind of an open approach enhances the understanding of the Buddha Dharma as a whole. The members of our group are encouraged to do the preliminary practices (Ngondro) as well as yidam deity practice as per what they have received, in smaller groups and in retreats organized by the Society. Following a non-sectarian model our Society is fortunate to hold the blessing of several eminent teachers from different Traditions (including H.H Dalai Lama and H.H The Gyalwa Karmapa- Ogyen Trinley Dorje). It is due to such an open approach that we have restrained from declaring our society as belonging to either one tradition or one teacher. However having said that we respect all authentic teachers and are honored to invite them to represent their tradition as one within the Mahayana Buddhism.